Overall, Enzymatic Therapy Acidophilus Pearls are a great daily probiotic supplement. I like that it gives you a ton of flexibility and is convenient since it doesn’t need to be refrigerated and can be taken with or without food! This probiotic makes on-the-go belly support a breeze. The tiny, pearl-like capsules come in blister packs of 30 each, but can be broken down into groups of 10. They end up being smaller than a pack of gum and can slip right into a purse or backpack. No need to tote around a big bottle of probiotics! One of the biggest advantages I love about this probiotic is that it uses True Delivery Technology, which supposedly ensures the delivery of live cultures to your digestive tract. They are built to withstand stomach acid (which is some pretty tough stuff) and are meant to stay alive even once they have hit your gastrointestinal tract. That means they can go to work and support your overall digestive and immune health. This is awesome because many other gelatin capsules simply stand no chance against your powerful stomach acid and are destroyed before they make it to where they need to go. What I don’t like about these probiotic pearls is that they’re not very allergy friendly. They’re not a good fit for those with soy, nut, fish or milk allergies. So keep that in mind! All in all, Enzymatic Therapy Acidophilus Pearls finally make it easy to travel with probiotics, are simple to take, and can give you the piece of mind that the money you’re spending on probiotics isn’t being wasted at the first sign of stomach acid. 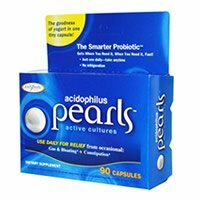 Acidophilus Pearls contain two distinct probiotic strains: Lactobacillus Acidophilus and Bifidobacterium Longum. Lactobacillus Acidophilus is naturally found in the intestinal tract and mouth. It has been shown to help break down and digest food particles and help absorb nutrients. By inhibiting the growth of candida or yeast, L. Acidophilus may help your body defend itself against urinary tract infections and yeast infections. Bifidobacterium Longum is a great addition to this supplement because it’s a live, healthy bacteria that’s naturally found in the digestive tract. It’s been shown to potentially help with boosting immune function, maintaining a healthy digestive tract, and preventing harmful bacteria from growing. Another plus is that it may help with preventing diarrhea while taking antibiotics and may help relieve some of the symptoms that come along with lactose intolerance. With 1 billion live cultures and these 2 unique strains; Enzymatic Therapy Acidophilus Pearls are a great option for a daily probiotic supplement. Acidophilus Pearls falls short regarding potential allergy concerns. Other ingredients in this product include: vegetable oil (palm and coconut), fish gelatin (Tilapia), vegetable glycerin, soy lecithin, and pectin. So if you have soy, nut or fish allergies, steer clear of this probiotic! The ingredients on the box also state that it “may contain a minimal amount of residual milk protein”. If you don’t seem to have any adverse affects from dairy products, this product could be ok. However, if you are lactose intolerant, I would suggest a product that can give you an absolute milk-free guarantee! Thankfully, Enzymatic Therapy Acidophilus Pearls do not contain wheat, gluten, yeast, salt, sugar, corn, artificial coloring, artificial flavoring, or preservatives. Enzymatic Therapy Acidophilus Pearls are one of the best values among probiotic supplements. You get 3 full months worth of a daily probiotic (and belly benefits!) for only 44 cents a day. I honestly can’t think of another product (of this quality) that’s this reasonable in cost! This route is less expensive than buying and eating yogurt everyday– so that’s a plus too! This probiotic had me pleasantly surprised when I experienced no side effects! Nothing is more exciting than a beneficial product that does its job without having you feel icky for a few days. Enzymatic Therapy Acidophilus Pearls don’t come with any guarantees, unfortunately. To buy Enzymatic Therapy Acidophilus Pearls, click here.